The other day, I went to my favourite pizzeria for dinner. It’s a bit off the beaten tracks, but the food is excellent, and there is even a real Italian wood-fired pizza oven… Usually, the place is rather quiet, but that day there were already people sitting at the bar, having an animated conversation. Funny how people start talking, isn’t it? He drove Honda too. I met him at Honda HQ in early 90’s. Yes, around 20 years ago. he has belonged with McLaren Honda. I met him at the press conference in Honda HQ, I have worked in Motorcycle publishing as a editor at that time. Sure! I have been worked 10 years at that field before move to Hong Kong. I also checked another on , F1 legend, Niki Lauda also Austrian. He got the title 3 times and have a lot of legend story. 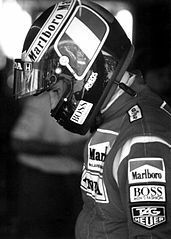 I can’t believe why you have not been introduced to Gerhard Berger! I met him twice, in Hockenheim and Spa Francorchamps back in 1994. I was working with the security staff there and had access to some restricted areas. By the way: He was driving Ferrari in ’94 and won the race in Hockenheim. I remember the engine sounds very well when standing beside the track: In those days the Ferrari engine had 12 cylinders whilst the Benetton Ford of Michael Schumacher had only 8, which resulted in very different engine sounds when they were driving behind one another. An experience I’ll never forget. Much better than on TV. On the other hand, when I was 3 years old, I sat in the racing car of Niki Lauda in Spielberg… Or so my family tells me – not that a photo survived of that feat though (or any piece of my own memory).